M2O Industries is pleased to announce the launch of its latest innovation in sock wear – Active Endurance. “By reworking our compression range, which is smashing it in all ultra-sports markets, we have been able to develop a new offering of technology and comfort for those who ride fast and hard”, explains Trent Fitzgibbins, Founder of M2O. Heat transfer zones designed around the proximity of arteries and veins in the ankle of aid thermal exchange and keep the entire foot cooler. As with all M2O products the new Active Endurance line is designed for fashion-minded riders and priced to ensure they are accessible for all. Available in all sizes from anklets through to full knee length the new M2O Active Endurance keep your feet cooler and more comfortable than ever. 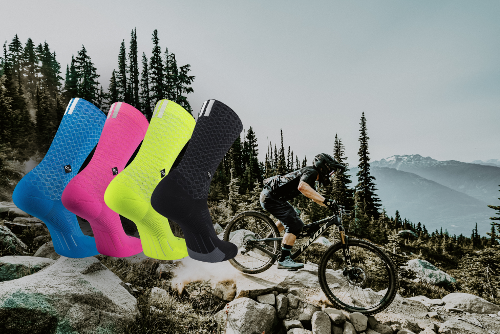 With all this innovation and comfort, priced from $15 upwards, visit any reputable bike retailer, or https://m2oindustries.com/ for more details on the full range of M2OActive Endurance socks.